Is Inhaled Pain Medication Safe During Pregnancy? According to a new systemic report from The Cochrane Library, pregnant women can safely use inhaled pain medication for pain relief during labor. The study included information gathered from more than 25 outside studies involving nearly 3,000 women. The size of the study population is extremely important to the validity of the outcome. Currently popular forms of pain relief during labor include the epidural and spinal. Both are invasive procedures that require inserting a needle into the spinal column. 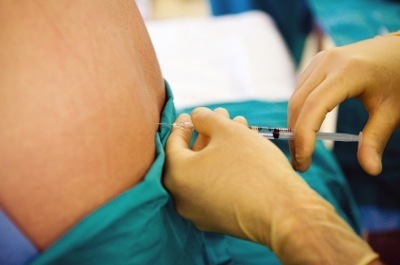 An epidural uses a constant stream of numbing medication to leave the lower half of the body essentially paralyzed. A spinal is a one hit – one shot version of the same type of pain block. Inhaled pain medications work in a completely different manner. When a pregnant woman inhales a combination of oxygen and a pain reliever like nitrous oxide, pain relief is achieved without hindering movement, breathing, swallowing or alertness. Women are essentially pain free without any of the negative side effects of a pain block. However, inhaled pain medications do come with a series of potential side effects like nausea, vomiting and dizziness. Nitrous oxide tends to cause more side effects than fluranes and fluranes tend to be stronger. Flurane administration requires a doctor educated in anesthesia be present during labor, but nitrous oxide does not – giving women birthing with midwives an alternative to natural child birth with no pain relief. The results of the review are positive, but not ultimately conclusive from a medical perspective. The larger pool of nearly 3,000 women is a good start, but larger pools need to be studied before fluranes or nitrous oxide is accepted globally as an alternative to tried and true pain relief during labor. Source: Trudy Klomp, Mireille van Poppel, Leanne Jones, Janine Lazet, Marcello Dr. Nisio, Antoine LM Largo-Janssen. The Cochrane Library / Wiley. September 12, 2012.